The cables on your garage door are designed to be strong, yet flexible. This allows them to carry the heavy load of the door and still roll over pulleys or be wound onto a drum. Garage doors will typically have either torsion spring or extension spring systems. 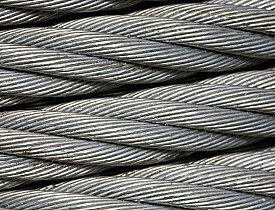 Which system you have will dictate how much wear and tear your garage door cables will experience. Find out how to maintain garage door cables for both systems. Homeowners need to know whether they have a torsion or extension spring system in order to understand the dangers involved with replacing garage door cables, should it become necessary. Torsion spring systems have a spring, or pair of springs, located above the door and running parallel to the door. Here, the garage door cables are wound around drums that are located at both ends of the spring shaft. As the spring "unwinds," the cables are pulled up and wrap around the drums. The cables run vertically from their connection point near the bottom of the door to the drum. This simple, straight cable run will last for years without much need for maintenance, but should be inspected regularly. When you inspect your garage door cables, look for kinks or frayed portions. If frayed areas are found, try to find what might have caused this damage. A protrusion in the cable path could be the cause and needs to be corrected to prevent future damage. It is also important to keep the cables free of accumulated debris and to avoid heavy lubricants, as these can attract dirt. If your garage door cables need replacement and you have a torsion system, it is best to hire a professional for this job. Torsion springs store a lot of potential energy -- after all, they do the majority of the work in lifting the door and must be "unloaded" to allow the cable to be replaced. This is a task that can be very dangerous if not done properly. Some caution here and professional help will ensure that no one gets hurt. Garage door cables on extension systems are simpler to replace, but caution should still be used. Here the springs, which are mounted parallel to the track, pull a pulley backward to provide lift for the door. When the door on these systems is in the raised position, it's fairly easy to remove the load from the garage door cables. IMPORTANT: When working on extension systems, secure the door in the raised position before releasing the spring's tension. This keeps the door from crashing down unexpectedly and will make your project go much more smoothly. A pair of "C" clamps secured below the bottom roller is a great way to do this. Just as in torsion systems, these garage door cables should be checked regularly for kinks and frayed areas. Another area to check with extension systems is the pulleys, which can see wear from repeated use. Keeping your garage door cables in tip-top shape is pretty straightforward. Replacing them, however, is a bit more involved and depending on your system, should be performed by experienced professionals. Your job as chief inspector is to monitor your garage door cables for signs of wear. Most systems are well designed and should provide many years of trouble-free service.